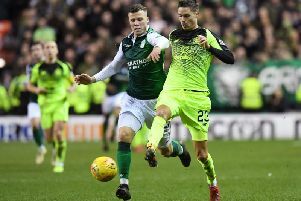 For months, Hibs kid Lewis Allan played with a nagging pain in his back, totally unaware that just one knock might leave him totally paralysed. What was initially thought to be no more than a trapped nerve proved to be a cyst which was slowly crushing his spinal cord, leaving the strapping striker to undergo a gruelling and intricate operation which lasted almost ten hours. And he faced further surgery lasting just as long when another lump was discovered only a few months later, the actual cause, he admits, looks likely to be one of life’s little mysteries. Now back in pre-season training, the 19-year-old revealed he first began to suffer early last year while on loan at Dunfermline, things coming to a head eight months later as he played for Forfar. He said: “It’s a weird one. When I was at Dunfermline, I missed a week’s training with a sore back which must have been that. I can remember it was agony playing games and I don’t know how I got through it but the sorest it got was in a friendly for Forfar against Montrose. I scored two but that was the last straw. Allan had put his problems down to possibly being a bit of tightness from working in the gym but the speed with which the results of a scan were returned brought home just how serious his situation actually was, the worst-case scenario being that it might be cancerous. He said: “I went to see the club doc but I thought going for a scan was precautionary. I never thought it would be anything serious. But that afternoon he phoned to say it was pretty serious. The medical staff had already held meetings about it. “I called the hospital and they said to come in when I could. I went in and saw a nurse. It was scary, she told me it might be cancer. I saw the scan and it was like a big cauliflower. A cyst is the more simple way of describing what it was. It had filled with blood because it had been growing so long and it had calcified. Further scans were planned to pinpoint any other cysts that might be present but blood tests showed nothing sinister, that it wasn’t cancer – which was a huge relief to Allan, his parents Craig and Sandra, his brothers, twin Sam, and three-year-old Kaden, even more so when it was confirmed the condition wasn’t hereditary. “Dr Khan at the Western General Hospital was brilliant,” said Allan. “He was very reassuring and every time I spoke to him I got good vibes. I’d done a search on Google but that just made it worse. Everyone becomes an expert when you should really let the professionals who really know get on with doing their job. The youngster from Melrose spent nine-and-a-half hours in surgery but still wonders just what caused the problem saying: “I’d have liked to have seen what they took out, but I didn’t. Allan spent some three weeks in hospital before returning home, revealing that in his darkest hours there were times when he feared he might never kick a ball again. He said: “The club were brilliant. They sorted a hotel out for my mum and dad and Alan Stubbs was in three or four times and the club physios were in twice a week. Allan was back at East Mains in January but, devastatingly, another cyst formed. He said: “I had a wee inkling it was maybe coming back so I went to see Dr Khan at the start of March. It had come back. It was a wee pocket but the concern was that if he left it, it could get bigger and who knew what would happen. Now Allan has his eyes firmly set on playing football again on a regular basis. He said: “To have played all last season would have been good. What’s happened has been very frustrating. At my age, I want to be playing first-team football. If not here, then out on loan again. “When I first came back I was feeling stiff and sometimes I was getting a bit of pain but I am feeling back to myself. As they say, time is a healer.